The Crook County Cowboys were only able to manage a sixth-place finish at the Reser's Tournament of Champions. The tournament, which features most of the top teams in Oregon, regardless of classification, has been owned by the Cowboys in recent years. "We competed well in both JV and varsity," Crook County head coach Jake Gonzalez said. "We had some guys out, but it is what it is. We had five placers and two champs, so it was pretty good." Had some guys out is a bit of an understatement. In recent weeks, the Crook County Cowboys have been decimated with injuries. Mario Hanson, 220, Jace England, 120, and Trevor Martin, 120, were all injured early in January, and none of them have returned so far. Then last Tuesday, in a dual meet against Culver, Jaxson Rhoden, 195, and Hayden Hilderbrand, 220, also suffered injuries. In addition, heavyweight Caleb Parrott didn't make the journey to Hillsboro for the tournament due to illness. On top of that, Zach Mauras was forced to withdraw from his fifth-place match Saturday afternoon due to injury default. Still, the Cowboys showed that regardless of who is out, they are still one of the top teams in the state. Despite not having a single wrestler above 182 pounds, the Cowboys still finished in the upper echelon of the 21-team tournament. 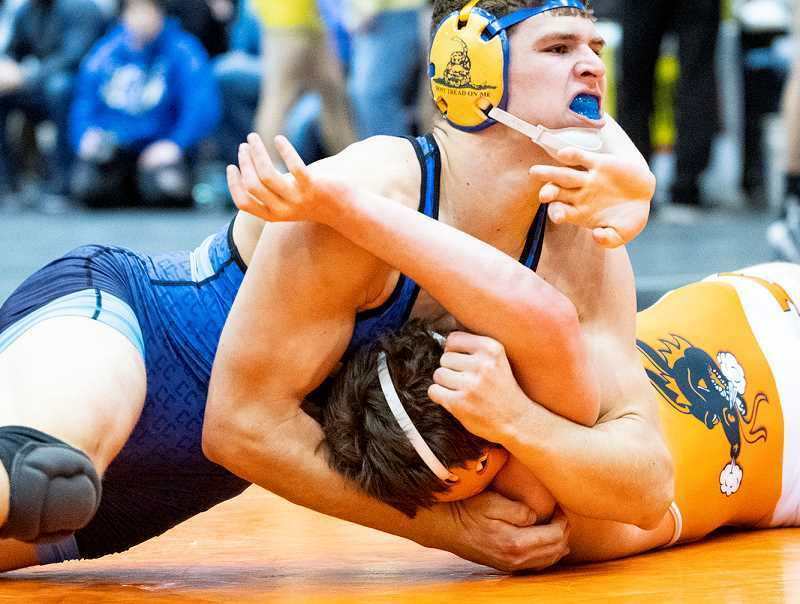 Hunter Mode rolled through his 126-pound weight class to win an individual championship for the Cowboys, while Kyle Knudtson had an even easier time at 182 pounds, winning all five of his matches by fall as he cruised to the weight class victory. Other Cowboys to place in the tournament included Tannon Joyner (fourth at 106 pounds), Steven Ware (sixth at 113 pounds) and Mauras (sixth at 132 pounds). Brayden Duke also had a solid tournament for the Cowboys. Duke reached the quarterfinals, before dropping his first match, and just missed placing, going 3-2 in the tournament. Other Cowboys to win matches in the event were Gavin McLean, 1-2 at 152 pounds, and Garrett Bond, 1-2 at 170 pounds. Newberg ran away with the tournament, amassing 214 points. Crescent Valley took second with 177.5 points, while Dallas finished in third, 157.5. Rounding out the top 10 were Roseburg, 147, Sprague, 135, Crook County, 122.5, La Grande, 120.5, Sweet Home, 115.5, West Linn, 115, and Lebanon, 111. Mountain View, which Crook County wrestled in a dual meet on Monday night, finished 11th with 109 points. Other Central Oregon teams in the tournament included Culver, 13th with 89 points, and Redmond, 14th with 86.5 points. The Cowboys fared better in the JV portion of the tournament, taking third as a team with 173 points. Roseburg won the JV meet with 258.5 points, while Sweet Home was second with 204.5. Eight Cowboys placed in the JV tournament, led by 106-pounder Tucker Bonner, who won his weight class. Bonner has wrestled varsity all year and is currently ranked third in the state. However, Joyner, who moved down from 113 to 106, took his varsity place this week. Other Cowboys to place in the JV tournament included Conrad Parker, fifth at 120, Gage Hanson, fifth at 132, Alex Vail, sixth at 145, Elijah Becker, fourth at 152, Gabe Saenz, fourth at 170, Colton Schlachter, third at 182, and Tanklin Thomasson, fifth at 285. Gonzalez noted that the JV portion of the tournament is so tough that anyone who places in the event has a legitimate chance of reaching the state tournament. "It's a tough tournament," he said. Gonzalez added that other than 220 pounds, the Cowboys should have a full roster for the Mountain View dual. The Mountain View dual was the final event on the schedule for the Cowboys prior to the Intermountain Conference championships, which will be held Friday and Saturday, Feb. 8-9. Although not all the injured Cowboys will be back for the tournament, Gonzalez said that the team should be at least close to full strength. "We should be back unless something crazy happens," he said. "We have to just keep getting better each week. Go Cowboys."